Sheer will. Or, in this instance, Scheer will. 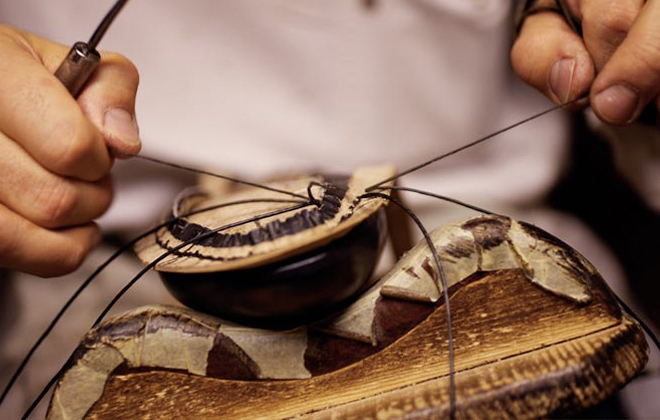 It takes just that to make some of the world’s most gorgeous handmade shoes. I have long been intrigued by bespoke shoemaking and what the world of shoemaking used to be like. Where does one find that kind of shoemaking today? 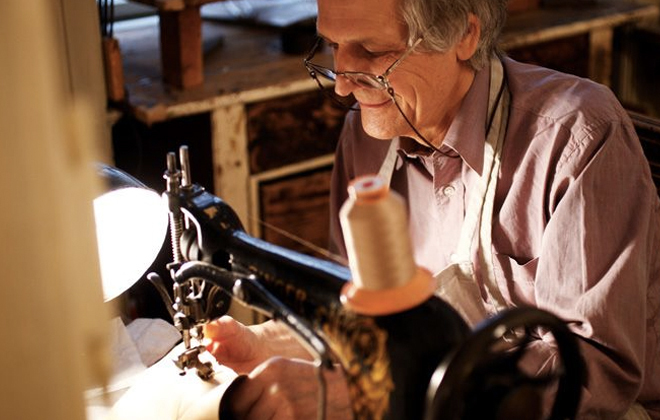 Is there a shoemaker out there that mixes old world tradition with our new world expectations? How do they manage to survive? I started my quest for some serious shoemaking in Vienna — a city that brings together the old and the new and is still considered a center for Eastern European shoemaking after all this time. 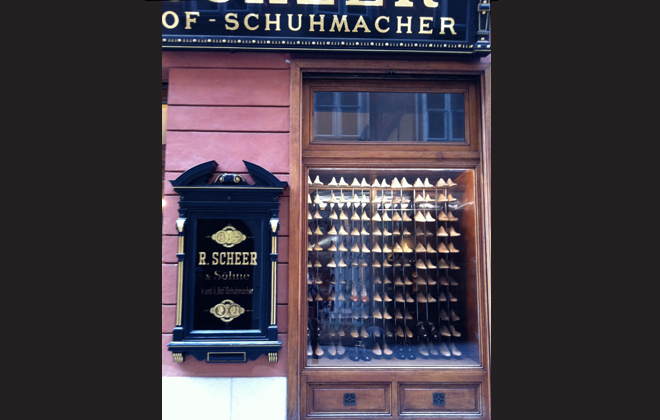 There I visited Scheer Schuhe, one of the worlds oldest and most renowned shoemakers. It turned out to be the perfect place to start. The exterior of Scheer Schuhe in Vienna. Love the rows and rows of wooden forms. Image by Interior Monologue. Stepping inside the shop, I was immediately greeted by a charming man who asked if he could help in any way. I fell in love…with the shoes and the store, of course!…because this store is just so beautiful you really couldn’t create a more beautiful shop if you tried. The charming man turned out to be Markus Scheer, the heir to the Scheer Schuhe business which was founded in Vienna in 1816. He is now running the business as the seventh generation of family shoemakers. The interior of Scheer was everything I hoped it would be! Very old, truly beautiful wide-planked wooden floors and original shelving, all lit by stunning Viennese light fixtures. I wish I could really share with you how beautiful the patina of the wood in the shop was, and how the the rows of wooden shoe forms mixed with the smell of the leather made this such a magical place. Markus Scheer lays it all out for us. 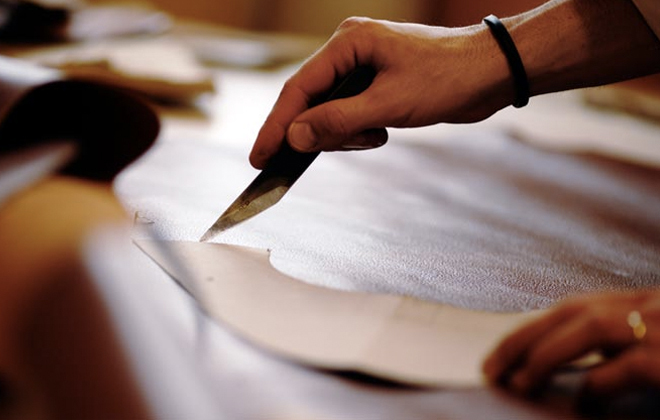 Cutting the leather. Image from Scheer Schuhe. What made one of the biggest impressions on me was Markus’ pride and passion for his craft. He didn’t just inherit the business, he inherited the soul and spirit of the company. As we chatted about the craftsmanship of shoemaking, it became clear to me that Scheer sets itself apart by not only making handmade shoes that are beautiful to look at, but shoes that are really good for the foot. That has been preserved at their core for over almost 200 years, while their styles have been delicately transported into contemporary fashion. Could this be a modern day woman’s orthopedic alternative to Manolo Blahnik? Hurrah! After years of walking in heels, having a shoe made to measure for the intricacies of my foot would be a true dream, although not a cheap one. And then there is the whole experience of buying a custom handmade shoe that certainly is not rivaled by the higher end shoe experience at Barneys, Bergdorfs, Harrods or the like, or even the brand name stores of the high fashion shoemakers. There really isn’t anything bespoke about them, is there? Markus generously spent quite a bit of his time taking me through the entire experience of buying a Scheer shoe –quite an intricate process that hasn’t changed since the company was founded. Your foot is measured in a million different ways. Then a wooden model of each foot is crafted that is uniquely yours. The shoe is then built around that customized form and designed to fit your foot like a glove. Shaping the wooden model. Image from Scheer Schuhe. A craftsman hard at work. Image from Scheer Schuhe. You can pick out whatever you desire for your shoe — from the overall style, to the leathers, soles, laces, and so on. You have to visit the shop quite a few times to design the shoe and for repeat measurements and fittings. 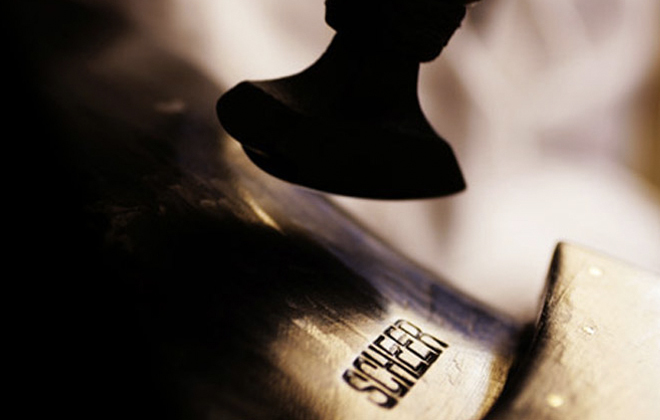 Each pair of shoes made at Scheer Schuhe ends up being a 60 hour process from start to finish. Once you own a Scheer pair of shoes, you are a customer for life. 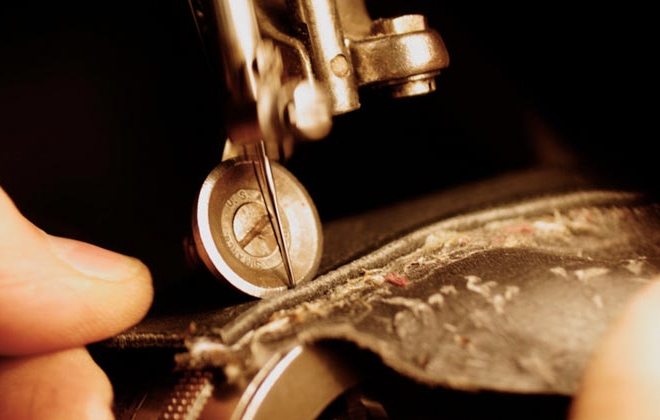 Your shoes will be impeccably maintained and repaired. Now that is custom-made, isn’t it? The finest stamp of approval. Image from Scheer Shuhe. One thing I didn’t achieve while there was to get beyond the Salon into the workshop itself to see how these gorgeous shoes are being made. Despite all my attempts at charming my way in, Markus couldn’t allow me to do more than peek into the studio itself. As it turns out, Scheer have never allowed anyone to take any photographs beyond the Salon and the only glimpse into the secretive old world of shoemaking is through the few pictures found on Scheer’s website. I was a bit crushed but have to admit that I did understand. The whole place made me so very happy it existed that I forgave him immediately. My journey into the world’s most gorgeous handmade shoemaking got off on the right foot so to speak, and I am excited to see what more I can find. Definitely encouraged! And I can report that Scheer Schuhe truly has a priceless heritage, but it does come at a price.